Hello intrepid horror enthusiasts. You’re back! And it’s November! And I’m damn proud of you for coming back to visit me. Although the coffin hopping has ended, and we are all wearing our sunglasses in front of the computer screen with the lingerings of make-up caked in the corners of our eyes, the horror fun has yet to stop. Last night’s gallery show/ Halloween extravaganza of amazingness was, well… hilarious really. The Vultures rocked the house, the pub crawl made it’s shambling way down main street and there were tons of people packing the most popular bars all down the way. Turn-out was a little low, but that meant I actually got to talk to everyone who was there and I had time to get my palm read. So, all in all, it wasn’t what I was expecting, but it was still a very memorable evening. Tonight my husband and I are off to visit the Deadites. They recently had us on their podcast, Trick or Treat Radio. We did a little clip of our top 10 guilty pleasure horror movies. You can find their podcast by going [here]. 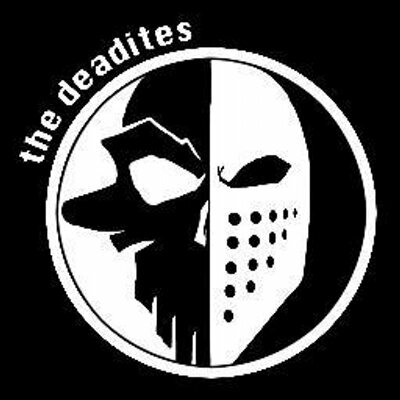 The Deadites are also a band and we’re going to see them perform up in Worcester MA. Tonight Alexander gets to be one of the costume contest judges and I get to just enjoy myself 🙂 which is good, because sleep continues to be a missing element in my life. Pounding through her shaking form. only dead leaves to be found. ripping , screaming, gushing blood. Shouldn’t have gone to grandmother’s house. But enough chatter, I know why you’re here. Let’s get to the Halloween prize commissions. To the winners of yesterday’s contest: Rebecca Treadway, A.F. Stewart, and Joanna Parypinski, Congratulations! I will be posting your requested creatures on Monday. And for those counting, yeah, that’s more than the ten promised. But really, what’s a little postage between friends? Everyone, please leave me your email (unless you already have) in the comment section so I can get some mailing addresses to send these lovelies to you. Thank you so much for joining me on my maiden voyage of Coffin Hop. You are all amazing human beings and I hope you’ll join me here for my regularly scheduled blogging every Monday at 9am.